Cheesy Zucchini Soup | What's Cooking at the Genua's? Last night I made a wonderful delicious soup for the first time. I want to thank fellow blogger Reeni for the inspiration. She posted the original recipe on her blog Cinnamon Spice & Everything Nice and I just had to make it myself. I did change it a bit because I didn’t have the exact ingredients on hand. It still came out incredibly delicious. I was sweating like crazy making this last night, it is Florida and still 80 degrees or so right now, but I kept at it. The recipe is pretty easy, but it does take time cutting up all the stuff. Oh how I wish I had a sous chef of my own to do all that for me! The original recipe I had called for vegetable broth. I had chicken broth and beef broth. I used chicken broth. It also called for a carrot. Didn’t have any, so didn’t use it. The recipe also called for ¾ cup grated Parmesan cheese OR 1 cup of shredded cheddar, swiss or pepper jack. I couldn’t decide so I used ½ cup Parmesan cheese and ½ cup shredded cheddar! Same thing with the herbs. It originally called for 1 teaspoon dried thyme or basil. I used ½ teaspoon of each. And the one final change or should I say suggestion that I left out was adding ½ cup of half-and-half or heavy cream. The soup didn’t need it and I didn’t need the extra calories! I’d say the recipe makes about 6 nice servings. I had two bowls and my husband had three! There is even enough for another bowl left over! So it’s a keeper! Please check out the original recipe on Reeni’s blog at Cinnamon Spice & Everything Nice! Mangia! In a large saucepan heat the olive oil over medium-low heat. Add the onion, carrot and celery, sauté until tender, about 5-10 minutes. (I cooked it for 10 minutes) Stir often. Add the garlic and sauté until you smell its wonderful aroma. Add the thyme and basil. Season well with salt and pepper. Meanwhile peel and dice 1½ of the zucchini (I used 2½). It should be about 5 coups. Shred the rest of the zucchini on the large holes of a grater and set aside. Add the diced zucchini to the pan and mix well, cooking for about 3-4 minutes. Add the broth and bring to a simmer for 15 minutes. Turn off the heat and purée the soup using an immersion blender. Careful of hot splatters with this! If you don’t have one carefully transfer the soup in batches to a blender and purée in batches. Return to pan if you used this method. 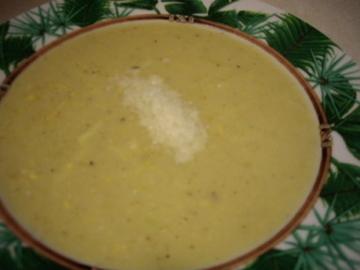 Once the soup is pureed add the shredded zucchini and the cheese. (You can add the half-and-half here if you wish) Stir well. Simmer for 5-10 minutes, stirring occasionally. Thanks for making my soup and for the rave reviews! I love it – one of my all time favorites. You’re very welcome! We loved it so much! Have to make it again, soon! !